When it comes to luxe aromatherapy ranges generally the price tag tends to reflect the luxurious experience, so when I find a range that can compete with the best but not break the bank I sit up and take notice. 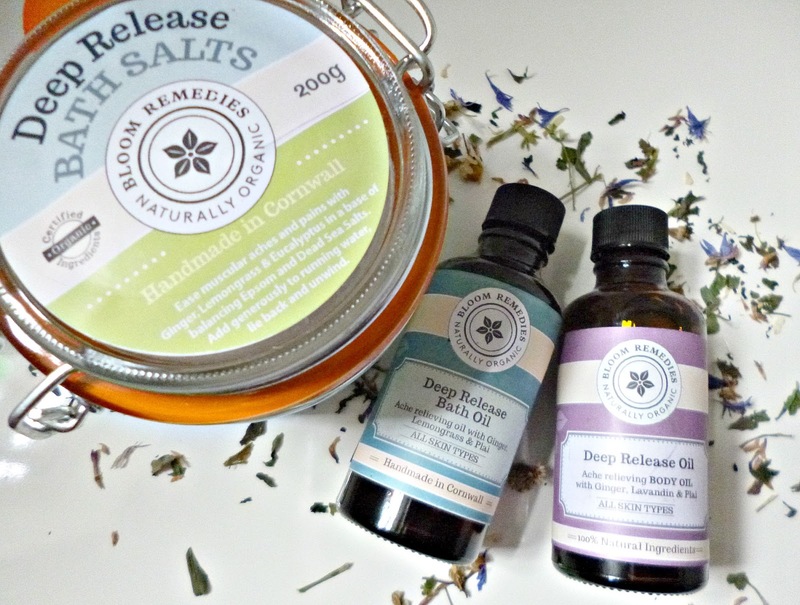 Bloom remedies have long been a favourite of mine, in fact I am pleased to say I was the first blog to feature this handmade line from the lovely Marie in sunny Cornwall. Bloom remedies brings together organic ingredients, Marie’s expertise in aromatherapy and thoughtful formulation in a line that covers skincare, body care and even Mum’s and babies. First up we have the Deep release bath salts (£13.00 200 grams) their full name is the Deep release organic skincare ache relieving bath salts, quite the title to live up to! 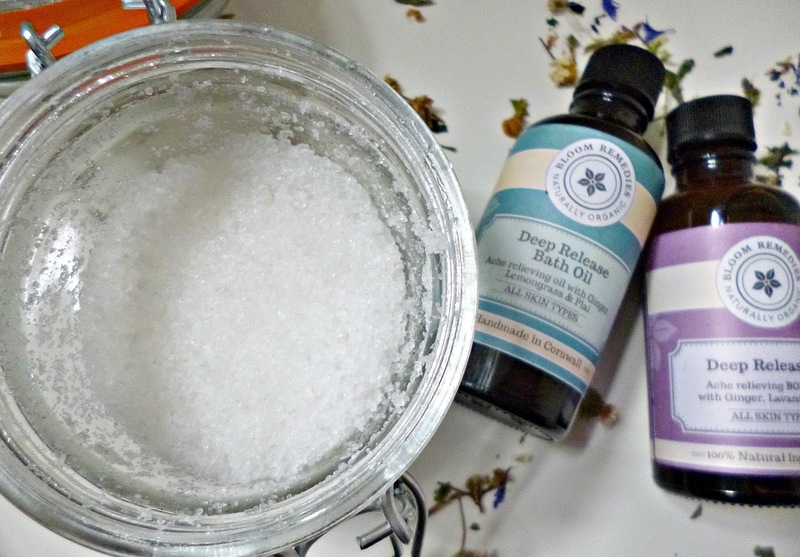 These salts are a mixture of Dead sea and Epsom salts with the above organic essential oils, the result is something quite special, as soon as you open the salts you can smell the deeply invigorating mixture which lingers throughout the bath. The instructions say to use a couple of tablespoons which was a challenge as I absolutely want to keep pouring every time I get these out, I refrain however because if I did they wouldn’t last very long at all. These are brilliant for minor aches and pains and combined with the warmth of the bath bring some welcome relief to sore muscles and joints, certainly one I would recommend you try. The next thing I ordered was the Deep release bath oil (£8.50 for 50 ml) with which a little goes a long long way, I like to use a small amount of this on it’s own or with some plain Epsom salts added to the bath as well. Full of beautiful hydrating oils such as sweet almond and sunflower oil this bath oil has the added bonus of dispersing in the bath and mixing with the water rather than just sitting on the surface like others do. Just like the bath salts I have been reaching for this whenever I am feeling especially sore and I have been really happy with both the results and the experience of using the products. Lastly Marie was kind enough to also include the Deep release body oil (£8.50 for 50 ml) also for me to try, this body oil has the exact same oils as the bath oil but without the added emulsifier, it is powerful and only a little is needed at a time, this used after a hot bath with one of the above and some gentle massage is just heavenly for sore muscles and joints as well as being deeply relaxing, I can see why it is called deep release! This is a wonderful aromatherapy range and I can see why Marie says that these products are favourites of hers to formulate. As the essential oils are very potent and used at therapeutic levels this isn’t a range suitable for very sensitive skin but for anyone else it is high on my list of recommendations especially if you are active or like me struggling with minor aches and pains. This post contains a complimentary sample included in my order, please see my full disclaimer for details.